This anchor came from the U.S.S. 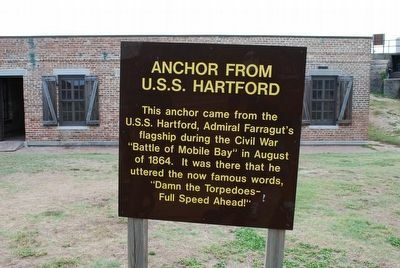 Hartford, Admiral Farragut's flagship during the Civil War "Battle of Mobile Bay" in August of 1864. It was there that he uttered the now famous words, "Damn the Torpedoes—Full Speed Ahead!" Location. 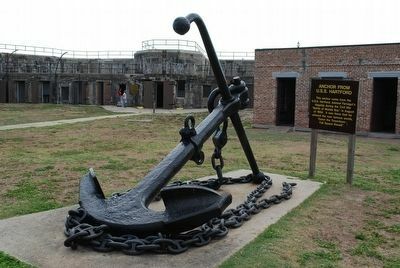 30° 14.902′ N, 88° 4.529′ W. Marker is in Dauphin Island, Alabama, in Mobile County. Marker can be reached from Bienville Boulevard east of Albatross Street, on the right when traveling east. Touch for map. 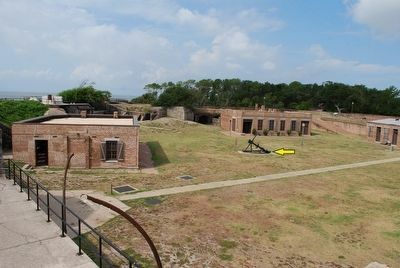 Located in the center grounds of Fort Gaines. Marker is at or near this postal address: 51 Bienville Blvd, Dauphin Island AL 36528, United States of America. Touch for directions. (about 300 feet away); 19th Century Shipwreck (about 400 feet away); Energy from the Sands of Time (about 600 feet away). Touch for a list and map of all markers in Dauphin Island. More. Search the internet for Anchor From U.S.S. Hartford. Credits. This page was last revised on June 16, 2016. This page originally submitted on August 16, 2015, by Brandon Fletcher of Chattanooga, Tennessee. This page has been viewed 296 times since then and 10 times this year. Photos: 1, 2, 3. submitted on August 16, 2015, by Brandon Fletcher of Chattanooga, Tennessee. • Bernard Fisher was the editor who published this page.